These are just a few of the building blocks put forth as part of a pluralist commonwealth. Among the others addressed in the book are climate change, decentralization, culture, democracy, liberty, investment, markets, technology, and trade. There is a short chapter that explains how each of these plays a role in the pluralist commonwealth that may be starting to appear on the horizon. 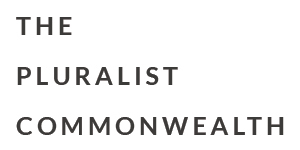 The Principles of a Pluralist Commonwealth proposes building blocks that help progressives and others envision something different that works for everyone. This entry was posted in Articles, Principles of a Pluralist Commonwealth. Bookmark the permalink. Both comments and trackbacks are currently closed.